I’m passionate (maybe even a bit fanatic!) about encouraging women, and especially moms, to exercise and be physically active as part of their daily lives. It’s not that I’m training for a triathlon or getting ready to run a marathon (believe me, that will never happen! ), it’s just that I love figuring out what works, finding the best exercise tips for moms, and sharing them with every woman who will listen. And the reason I think that exercise tips for moms are worth finding and sharing is that I’ve seen the difference that regular exercise can make in a woman’s life, including helping her feel better, look better, maintain a healthy weight, feel sexier and manage stress more easily. I’ve seen and felt those benefits in my life, and I want you to experience them in yours. And so I keep looking for the very best exercise tips and hacks – practical things that busy women can actually do, despite their hectic lives. The problem, of course, is time. 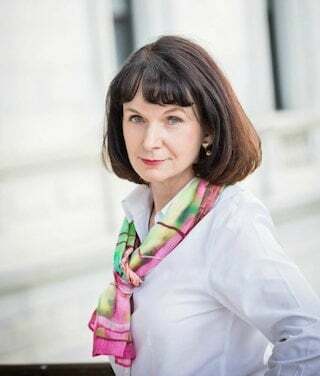 Most women, and especially moms, take on too many tasks every day – working, caring for children, teaching, training, transporting, shopping, cleaning – the list goes on and on. They simply can’t find time to exercise. Or so they believe. But, let me be blunt here – you do have time to exercise – to get up and move your body – every day, if you make it a priority. 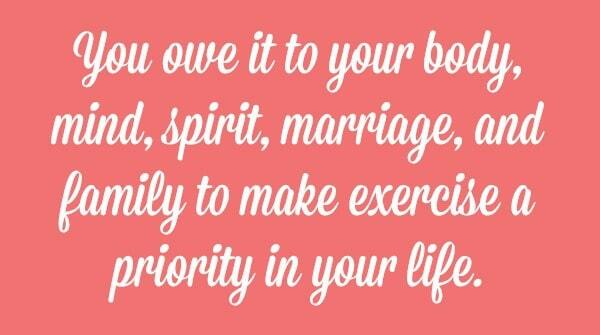 And you owe it to your body, mind, spirit, marriage and family to make it a priority. 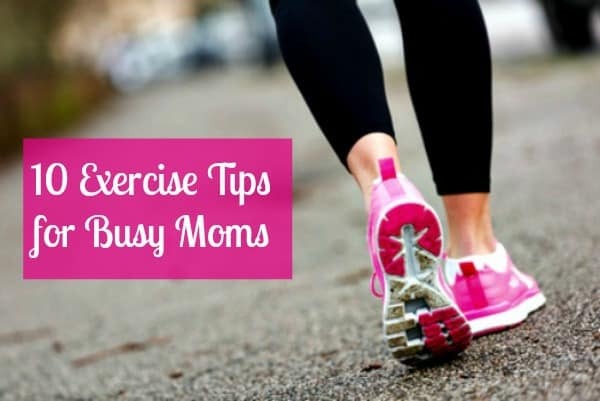 So here are 10 exercise tips for moms that can help you find ways to make time for exercise, even on your busiest days. Try one or two this week, and evaluate how they work for you. Then try one or two more, until you come up with the best strategies for your busy life. 1. Walk while your children are at sports practices or other activities. Never sit on the bleachers at soccer, baseball, or football practices! Get up and walk. Invite other moms to join you if you want to socialize, or walk alone if you want some peace and quiet and time to think. When your kids have indoor activities, find a place nearby to walk, maybe just around the block several times. 2. Track it. Use an exercise monitor to keep track of how much exercise you’re getting (includes Amazon affiliate links). I use a FitBit Alta HR, which lets me monitor steps, distance, heart rate, and calories burned. I’ve also used a FitBit Charge HR and FitBit Zip, as well simple inexpensive pedometer. The benefit with all of these monitors is that they let you know how active (or inactive) you’ve been, and they serve as a great reminder to get up and move. 3. Workout with a 15- or 20-minute online exercise program. Find several programs you like and bookmark them, so that you can do them easily at home. Do one of them when you can’t get out of the house or when you need to fit in some exercise quickly and easily. You can find hundreds of programs online that feature every kind of exercise imaginable – aerobic, strength, yoga, dance or just about anything else you like to do. Here are some workouts from Prevention Magazine as a place to start. 4.Take regular walks around your neighborhood. If your children are young, load them up in a stroller or wagon. If they’re a little older, let them rides bikes while you walk. And if they’re old enough to stay home alone for a short time, take a walk with your husband. Do this regularly, and it will become a wonderful habit. My husband and I used to walk a circuit around our property and our neighbor’s property every evening while our boys played outside. We just kept circling for about 30 minutes, which sounds boring, but it became a great time for us to talk and spend time together uninterrupted. 5. Walk at lunch. If you work outside your home, take a walk during your lunch hour or find a place in your building to do a light workout. If you’re at home, get out and walk before or after lunch. 6. Dance! Dance around the house with the kids (they love to see Mom being silly! ), dance with a video, dance with your husband or just dance by yourself. Dancing can be fun, intense or even sensual. But it’s always a good way to move your body and work up a bit of a sweat. 7. Get up 20-30 minutes earlier several days a week and exercise before you start your day. 8. Join a center or class. If money and your schedule permit, join a fitness center or exercise class. Look for inexpensive options before you join a pricey gym – in my city a large church offers extremely cheap memberships to its fitness center (for anyone, not just church members), and in my sister’s city the local recreation commission operates a reasonably-priced family fitness center. 8. Do active chores. Get out in the garden, rake the yard, or wash the car. Get the kids involved. Do the same kinds of chores for an elderly relative or neighbor. 9. Exercise with a friend. Find another mom, a co-worker, a friend or a neighbor who wants to get fit, and exercise together. This approach helps you stay on track with your exercise plans and makes the whole process a little bit easier and a lot more fun. 10. Get your family outside for some active fun. Two or three times a week, get everyone outside being active and having fun. Kids love to play Frisbee, soccer, or catch with their parents. Ride bikes together around the neighborhood. Shoot hoops or hit a tennis ball around. 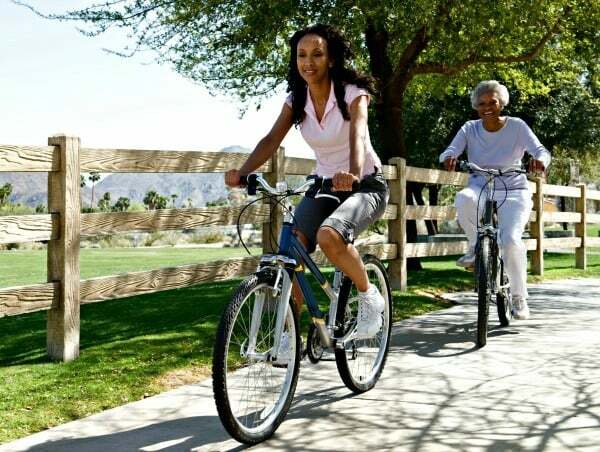 On the weekends or when you have a little more time, take a hike or ride bikes on a trail. Get outside and enjoy nature. If you really have difficulty fitting exercise into your schedule, consider investing in a treadmill. Yes, it’s an investment, but it can yield big dividends. We paid about $600 for our treadmill, and it’s probably the best $600 we ever spent. No matter what the weather or time of day, we can always fit in some exercise. My husband watches TV while he walks on the treadmill, and I read while I walk. 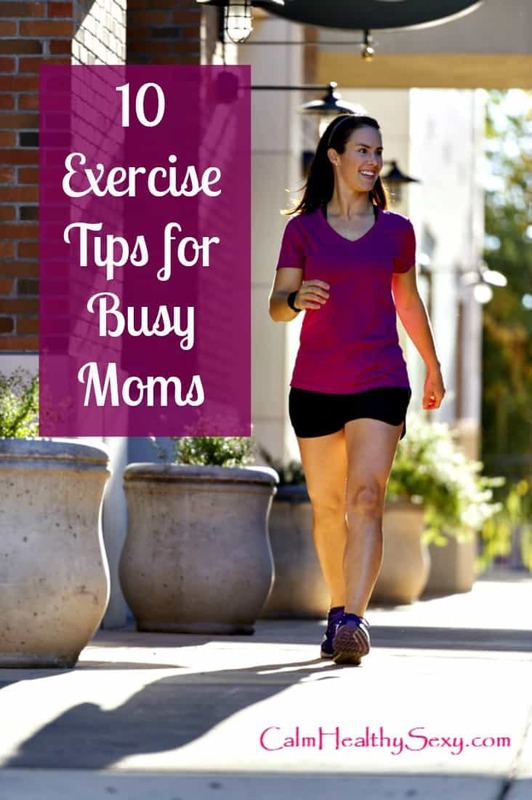 Most busy wives and moms struggle to exercise regularly, but making time for exercise in your busy schedule is well worth the effort. It will pay you back many times over in terms of better health, less stress and more peace of mind. What are the struggles you face in trying to be active every day? What strategies have helped you be more active? What are your best exercise tips for moms? Please share your ideas in the comments section – I would love to hear from you. 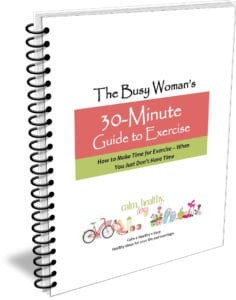 For more practical ideas on how to add exercise to your busy life, check out my ebook The Busy Woman’s 30-Minute Guide to Exercise.